The parents of missing British girl Madeleine McCann released a new artist's impression today of a man they claim could be involved in their daughter's disappearance. The sketches are based on a description given by a British vacationer of a man acting suspiciously in the Praia da Luz holiday resort in Portugal, about two weeks before the girl disappeared. Madeleine vanished May 3rd, a few days before her 4th birthday, during a family vacation in Praia da Luz. Family spokesman Clarence Mitchell told a London news conference the image is similar to a previous description of a man seen carrying a child on the night of the girl's disappearance. 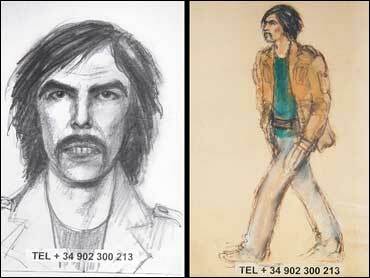 The FBI-trained police artist's impression shows a man with long hair, bushy eyebrows and a moustache. Gary Thompson, Associate Editor of the News of the World, said the sighting was from Gail Cooper, a tourist who was on holiday in Portugal shortly before Madeleine went missing. "But the real significance is that it's been shown to Jane Tanner, who you may recall says she saw a man leaving the apartments carrying a child on the night of May 3, the night that Madeleine went missing," he said. "We understand that Jane Tanner has confirmed the likeness, so you've got two independent witnesses." "He made my blood run cold and gave me the creeps," said Cooper, who was staying near the McCanns' appartment, and who had three separate chilling encounters with the mystery man. Sunday's paper revealed other witnesses, who confirmed the likeness. Two of Cooper's sightings were also witnessed by her husband, and another witness - a 12-year-old girl - backed up her story, according to News of the World. "He seemed really strange," Cooper said, recounting one occasion when the man (whom she believes was not Portuguese) came to her door. "He said he was collecting for an orphanage in nearby Espiche that was caring for three children whose parents had recently been killed in an accident on the main coast road. The man was rambling and becoming agitated. I thought he was a con man trying to pull a fast one." The newspaper confirmed that the orphanage cited does not exist, and did not find any evidence of the fatal car crash he mentioned. Madeleine's parents, Kate and Gerry McCann, who have run an international campaign to find their daughter, returned to Britain in September, a day after they were named as formal suspects in the case. Forensic tests conducted at a government laboratory in Britain found evidence that DNA from Madeleine was in the trunk of a rental car the parents used after her disappearance. But Portuguese police said the tests on the car were not conclusive and investigations are continuing. The inquiry initially focused on the possibility that Madeleine had been abducted from her hotel room at a resort while her parents were dining at a nearby restaurant. A source close to the probe called the release of the sketches "a stunning breakthrough." "We now have a manhunt. Where is this man now? We need to find him as soon as possible."